We now come to St. Louis de Montfort’s third way of describing the Christian life: life “through” or “by” Mary – the French is par. We look to Mary as the source of all life. The main point of doing this, and the way it shapes our life, is that we recognize our need for grace. On the one hand, simply to recognize that we are not self-sufficient is to make great strides in the spiritual life. The Desert Fathers said the heart of the spiritual life is simply to pray constantly the Psalm verse, “God come to my assistance, Lord make haste to help me.” To live in light of salvation. This frees us, on the one hand, to recognize our sin. On first read, de Montfort’s take on this can be off-putting. In an infamous passage, he tells us, “You will consider yourself as a snail that soils everything with its slime, as a toad that poisons everything with its venom, as a malevolent serpent seeking only to deceive.” I know I am not the only one who put this book away the first time I read things like that! But de Montfort’s point is not about our sin, but our salvation. When we recognize that God sends his grace to heal us, we no longer have to hide our sin. We can acknowledge our stupidity precisely because we know it is not the last word. Pope Francis speaks of “the caress of the mercy of Jesus Christ on my sin”: the point is not to wallow in sin, but to feel that caress, and know that our sin is the occasion for God to send his healing mercy. I don’t have to defend myself; Jesus handles that. Second, to recognize our constant need for grace is to recognize that, beyond our sin, God also calls us beyond the limits of even sinless nature. What the heart of man has never imagined, God has prepared for us (1 Cor 2:9). To live always by God’s power is to realize he calls us not to what our limited power can reach, but “to become partakers of the divine nature” (2 Peter 1:4): the very life of the Trinity. But why through Mary. Why not just say through Jesus, or with the Desert Fathers, “God come to my assistance”? In fact, de Montfort’s own motto was “God alone!” Why then through Mary? First, ironically, because Mary emphasizes Jesus. It is so very easy for Jesus to become an abstraction: either a super man, or just sort of a face of God. The Incarnation itself – what happened in the womb of Mary – really does surpass our capacity for understanding. 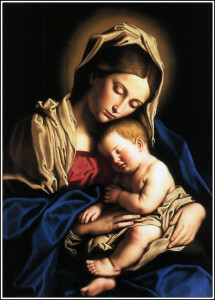 To focus on Mary is precisely to focus on Jesus. To say “all through Mary” is to say “all through the mystery of the Incarnation”: no grace comes to us except through that amazing union of God and man. That is the source of our healing – not some vague God in the sky, but the one in Mary’s womb. Second, Mary helps emphasize for us the human effect. Grace is God’s work – but it is in the heart of man. To think of Mary as Queen of Heaven is important precisely because it reminds us that a human person can become Queen of Heaven, that we really can enter into the heart of God. That purity from sin is a possibility: an impossibility by our own efforts, but possible by God’s grace. And perfect, divine, Trinitarian love: that can actually happen in a human heart. Mary abides in the heights of heaven, in the heart of the Trinity! Gosh, that is so hard to believe that we need to think about it. To live “all through Mary” is to live in constant union with the truth of what God has done in her, and calls us to let happen in our own hearts. Third, to think of Mary is to think of the mystery of election, and predilection. Mary is lucky, the luckiest one of all. She did not earn God’s love. Nor do we. We shoud realize how lucky we are: to know the truth of the Gospel, and even more, to have the fire of the Spirit in our hearts. We should not put too human a face on God – it is easy to replace God with something far less. But it is important to remember the tenderness of grace, the personal relationship, the personal choice – not first ours of God, but God’s choice of us. Mary helps to give us that personal touch, without washing out the mystery of God. How does Mary help you understand God, and Jesus?